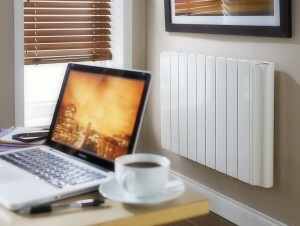 Our range of energy efficient electric radiators look great in any setting. Here’s a gallery of Economiser and Vantage Radiators. All radiators from Ecopower Heating are built to look plain and unobtrusive – suitable for any setting. Electric heaters with prominent buttons and displays, front facing vents and unsightly designs, rarely appeal. They can detract from the decor of a property, and become an unwanted feature in the room. 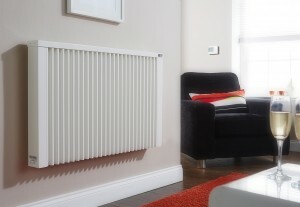 Like traditional radiators, our range is designed to fade into the background. This is one of the Economiser Radiators that were installed in Mrs Simpson’s home in Cornwall. She needed an efficient electric heating solution to heat an extension that added an extra bedroom and kitchen diner to her home. The easy installation and wireless control system meant that there was no need to upgrade the existing boiler, or install additional plumbing. We can help with installation, and any technical queries 0900-1700 Monday to Friday. 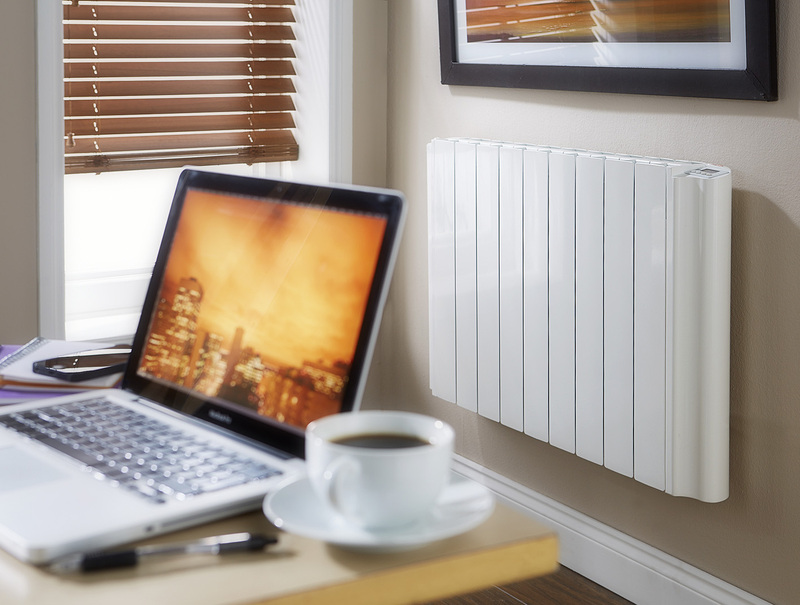 Vantage Electric Radiators are the perfect heating solution for offices in commercial properties and the home. Home offices often require different time and temperature settings to the rest of the house. When working from home, it’s possible to heat only the area that you are using. Where conventional central heating systems require a boiler, and struggle to provide localised heat in specific areas, the Vantage allows total control over each individual space. 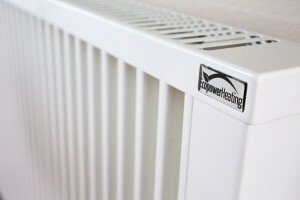 The Economiser Radiator is finished in pure white. With unobtrusive styling, and no unsightly buttons or displays, the Economiser suits any decor, and will never look dated. The powder coated steel body is extremely tough. It is scratch resistant. It won’t fade or discolour over time, or cause marks on walls. Note the wireless programmable thermostat on the far wall, which is set to control all radiators in the lounge area. 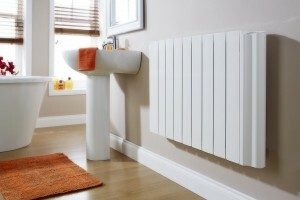 All Ecopower Heating electric radiators are safe for use in bathrooms. With ratings of at least IP24, the Economiser and Vantage Electric Radiators can be installed in bathrooms, to give a comfortable mixture of radiant, and convectional heat, either on-demand, or from a program. Full programming is possible across seven days, and a locking function prevents unwanted adjustments or tampering. 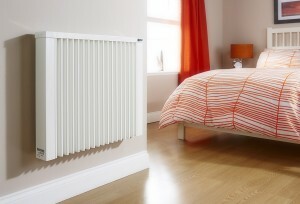 Bedrooms are heated effectively and efficiently with Economiser Radiators. 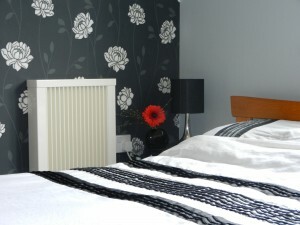 Often, a smaller radiator is used in bedrooms. We suggest a temperature of 16-18 degrees, for comfort and economy. Whilst at rest, the temperature can be set back. 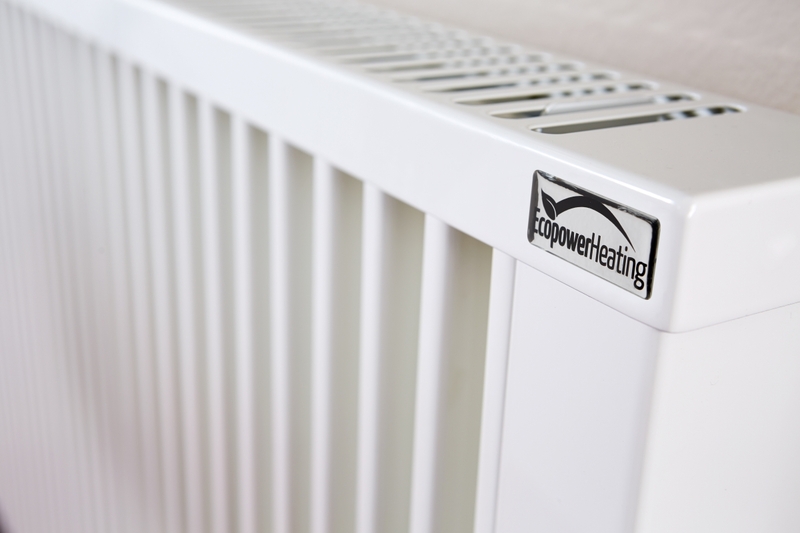 With no exposed heating elements, the Ecopower Heating range does not dry the air, as panel heaters do.